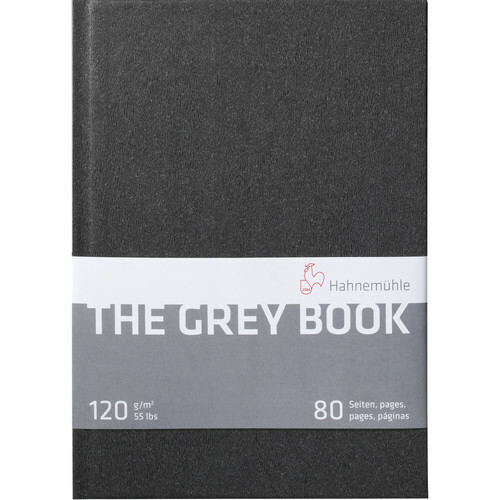 A5 Size: 8.3 x 5.8"
Size: A5 Size: 8.3 x 5.8"
A4 Size: 8.3 x 11.7"
The Gray Book from Hahnemuhle is a stitched-bound A5 sized book, which contains 40 sheets / 80 pages of light gray paper for drawing and sketching. Each page has a basis weight of 120 gsm and the cover has a textured wood-grain feel to it. The anthracite colored cover lays completely flat when opened, which allows you to draw seamlessly across two pages. In addition, a red ribbon bookmark is included, so you never lose your place in the book. Box Dimensions (LxWxH) 8.4 x 6.0 x 0.4"